Collect and share the quotes and famous phrases you love. Includes quotes in 5 languages, for a total of 100,000 carefully selected quotes. Save and organize your quotes by folders and tags. Create your list of favorites quotes and organize them by folders and tags. 5 archives of carefully selected quotes included. 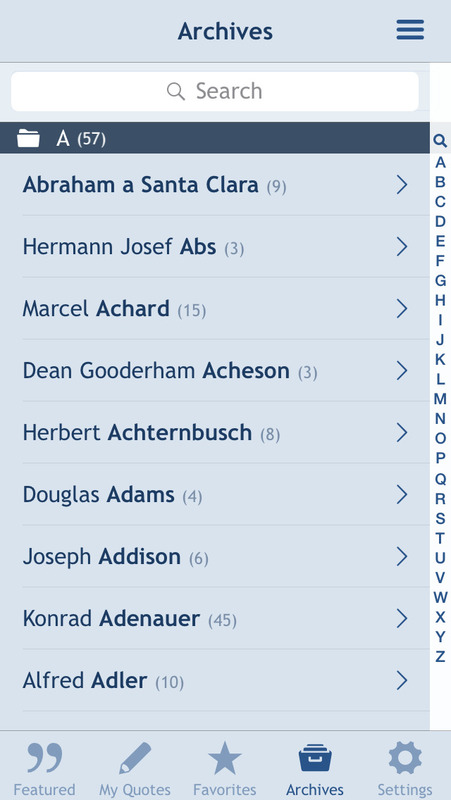 You can also check the Wikipedia author's page from within the app and get random quotes from the archives. Share any quote as text or image with your friends by SMS, mail, Airdrop, Facebook, Twitter, Flickr, Sina Weibo, Trecent Weibo, or copy and paste it everywhere you want. Want to try it? Download the free version!